Dr. David M.Press grew up in Clifton and graduated from Clifton High School. He continued his education at The University of Pittsburgh, where he received a Bachelor of Science degree with a major in Biological Science. After college, he attended the University Of Pennsylvania School Of Dental Medicine, where he graduated with a D.M.D. degree. 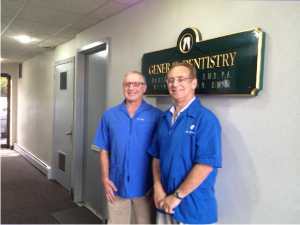 Upon graduation from Dental School, he joined the practice of Dr. Seymour Press in the Allwood area of Clifton, a practice dating back to1949. Dr. Press also completed a mini residence post-graduate program in periodontics at Albert Einstein College of Medicine. His hobbies include swimming, raising dogs, reading, biking and spending time with his family. Dr. Wayne M. Berman was born and raised in Clifton. After graduating from Clifton High School, he attended Rutgers College. Subsequently, he attended University of Pennsylvania School of Dental Medicine and completed a general practice residency at St. Joseph’s Hospital and Medical Center where he was asked to stay on and teach part time. Dr. Berman is a member of the American Dental Association, New Jersey Dental Association, Passaic County Dental Society and the ITI Implant Study Group of New Jersey. Dr. Berman is married with two daughters. In his spare time, he enjoys being with his family and cheering on the New York Giants.